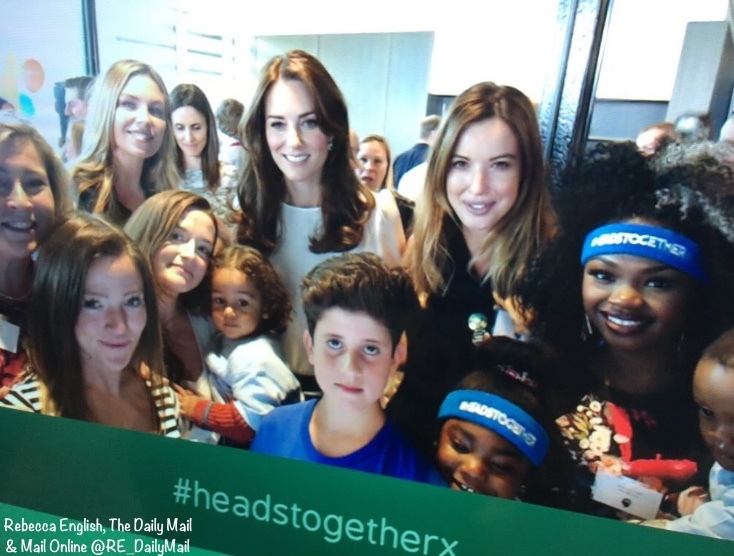 The Duchess wore Banana Republic and Goat Fashion for today’s Heads Together launch. Kate was joined by Princes William and Harry for the official kickoff of the charity focused on mental health issues. The function was held at the Queen Elizabeth Olympic Park. On their way in to the facility all three seemed to be looking at the structure that held the Olympic Flame during the 2012 London Games. You can see Harry pointing as he walks with Kate’s private secretary. Representatives of the charities participating in the new initiative were on hand. 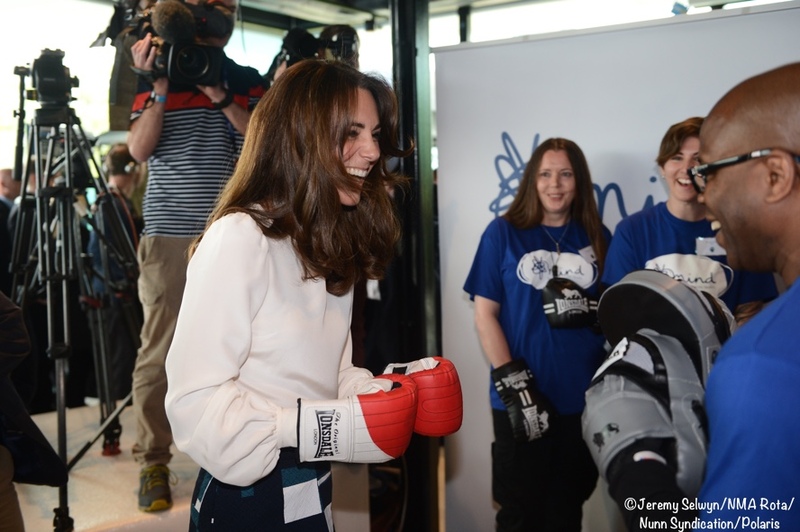 Kate tries her hand at boxing as part of a demonstration emphasizing the mental health benefits of exercise. 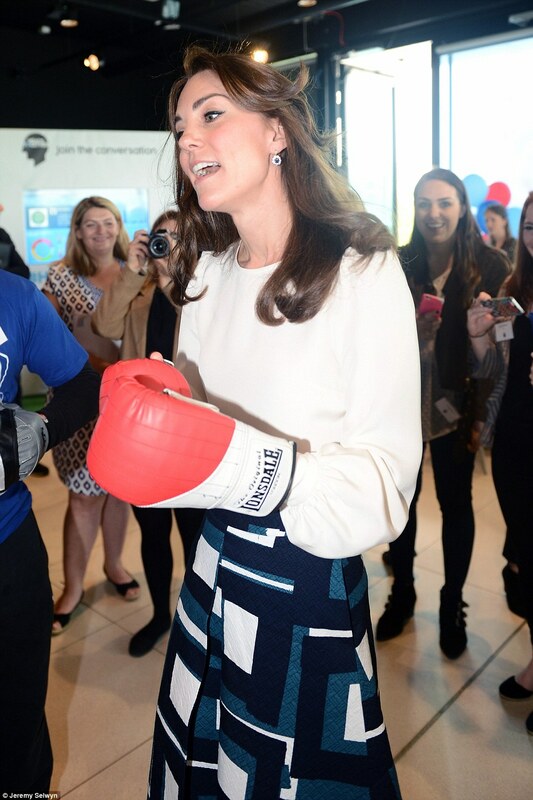 This is the moment the Duchess of Cambridge wowed a boxing crowd as she pulled some powerful punches at the launch of a new mental health campaign. Apparently Kate couldn’t wait to get the gloves on and had a ‘mean right jab’, the sportsman said afterwards. Kate in a selfie with model Abbey Clancey. During the morning’s events participants were asked to specify what made them happy. Harry said “making people smile,” while Kate said “a walk” does the trick for her. 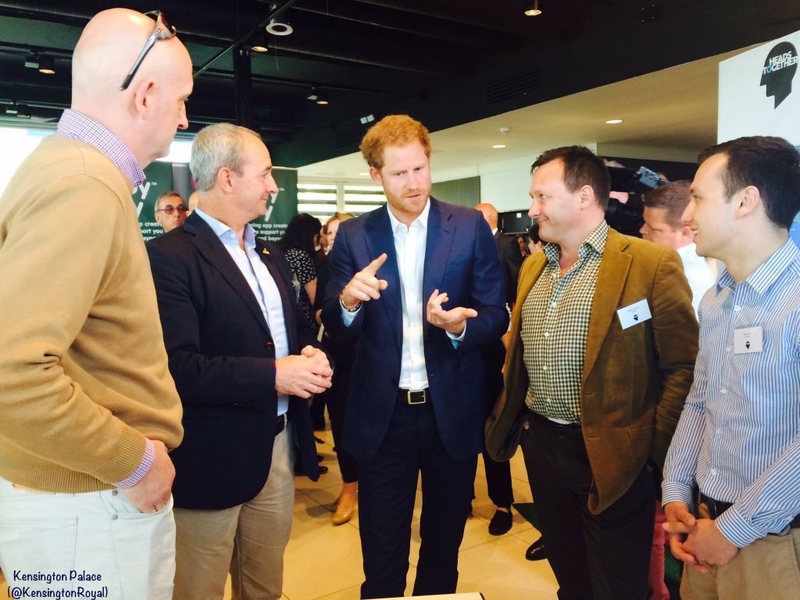 Below, Harry speaking with veterans about the hidden wounds faced by military personnel and families. The Prince, who holds the rank of captain in the army, is a strong believer in helping servicemen and women rebuild their lives post-war. The Prince chatted to representatives from Contact Armed Forces – a collaboration of state and charitable organisations working to improve mental health support to the Armed Forces community. There was also a DJ spinning records at this morning’s event. 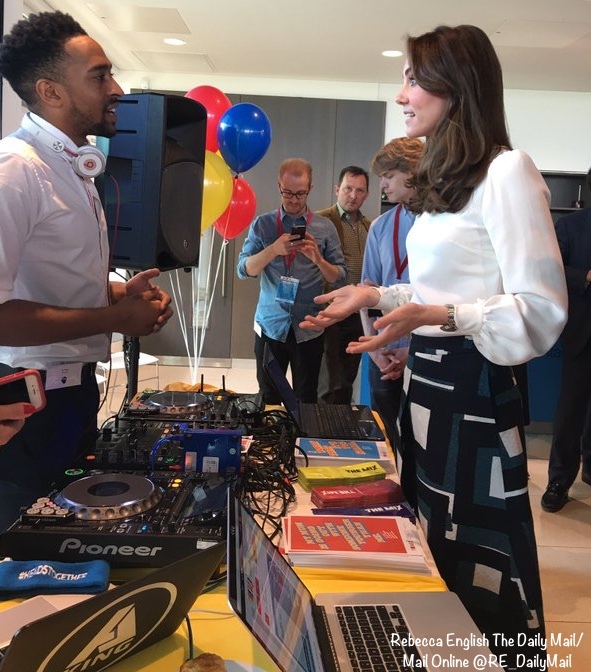 He put together a mix tape and included requests from the royals; Kate asked for “Heaven” by Emile Sande. The trio spoke about the need for more mental health support. 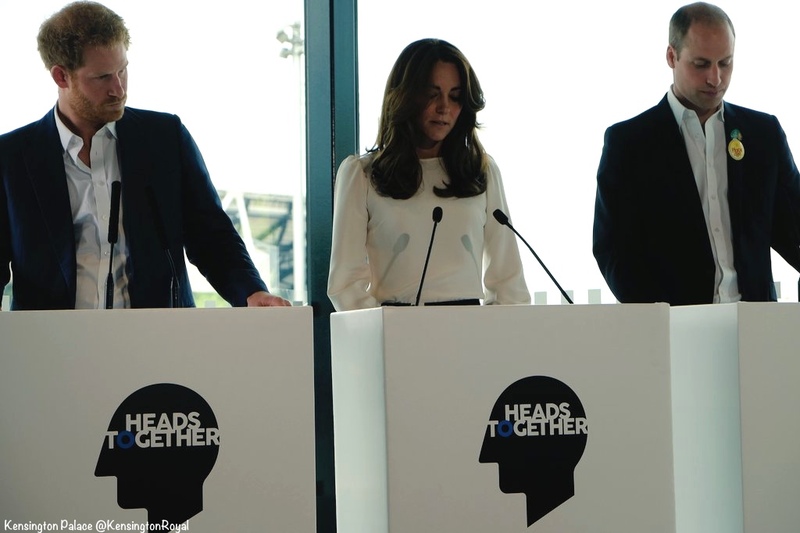 In this quick clip Kate talks about destigmatizing mental health issues. 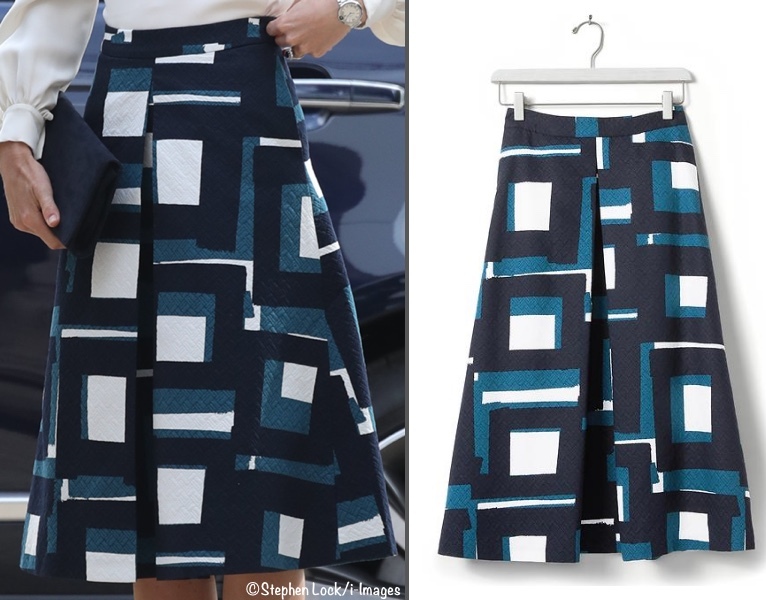 Taking a look at what Kate wore for today’s function, we begin with the skirt by Banana Republic, the label’s Geo Jacquard Skirt. The garment is midi-length, with a full skirt hitting mid-calf. It is 100% cotton in a large graphic print called ‘preppy navy,’ hopefully you can see the texture of the fabric below right. The piece has a back zip, on seam pockets, waistband, and full polyester lining. The skirt appears to be sold out at Banana Republic, but you can try the retailer’s “find in store” option. It is available in limited sizing at UK retailer Zalando, where it is £105, about $150. 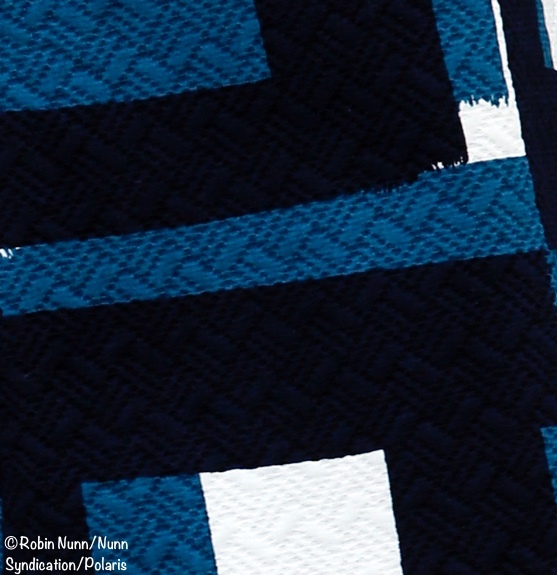 A closer look at the jacquard fabric. Kate’s blouse is by GOAT Fashion, a brand becoming a favorite for the Duchess. The ‘Binky’ blouse is 100% silk; it has a slim fit, round neck, and full sleeves that gather into the cuffs (£290, about $415). Another look at the blouse, which is now sold out in the cream color, but still available in black. Kate accessorized with her Rupert Sanderson Malory heels. The shoe features a pointed toe and 4″ heel ($675). Kate carried her Frome clutch by LK Bennett. 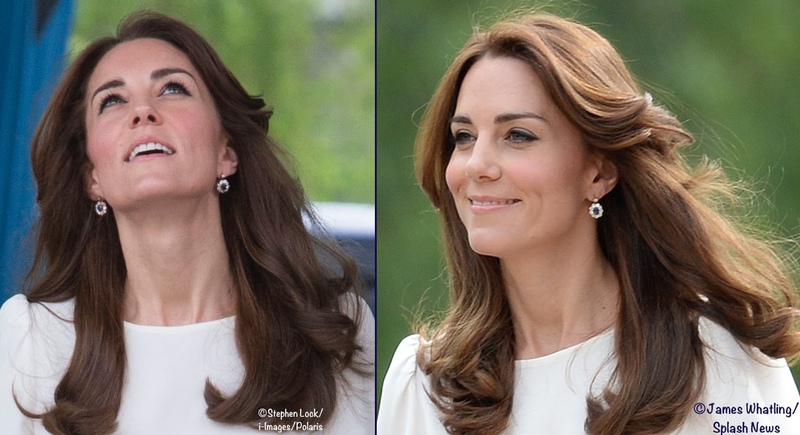 The Duchess wore her sapphire and diamond earrings. As well as her Cartier Ballon Bleu watch. ….it can be tricky to find the balance between looking appropriately chic and but also keeping cool. This morning, the Duchess of Cambridge showed us a winning workwear combination which will take you from meetings in the chilly air conditioning to the sticky commute home in style. We will update with more photos and info shortly. 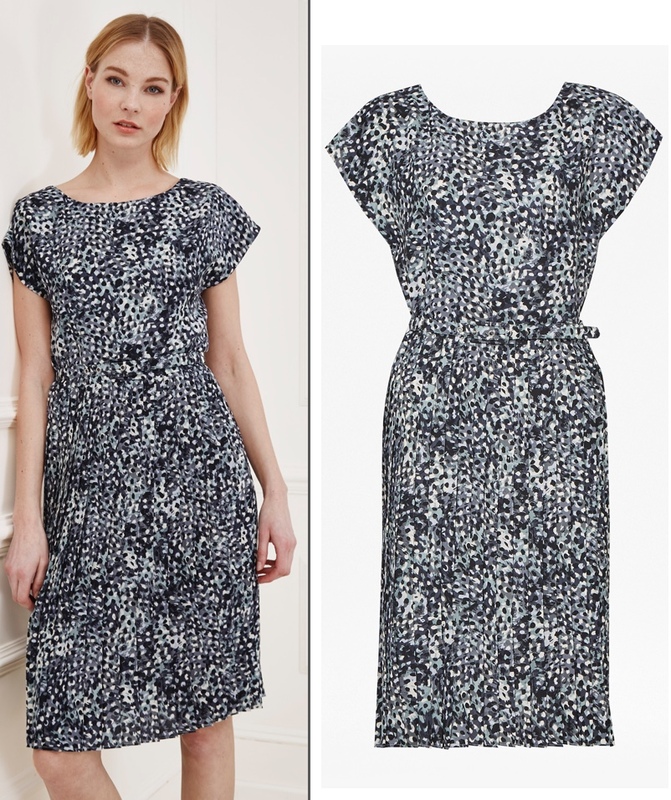 Also today, the return of a Kate classic, the ‘Cezanne’ dress by Great Plains. Many readers will probably remember the style. 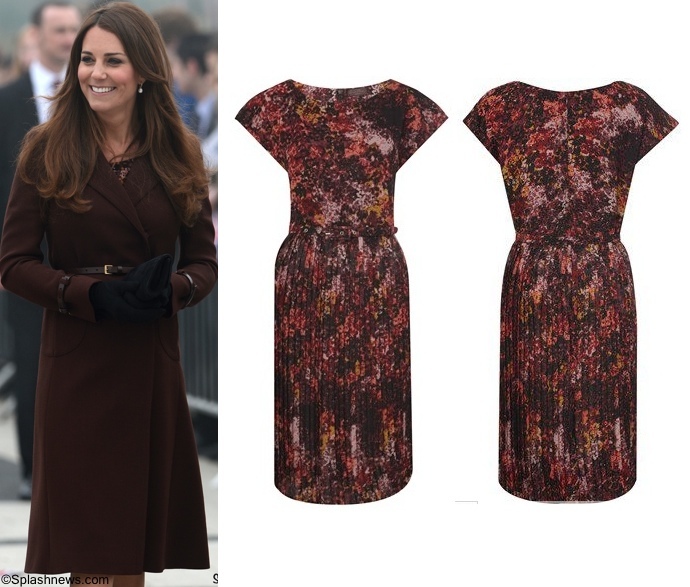 The Duchess was first seen wearing the Cezanne for a series of engagements in Grimsby in May of 2013. On that occasion she wore the Cezanne ‘winter pink’ color. 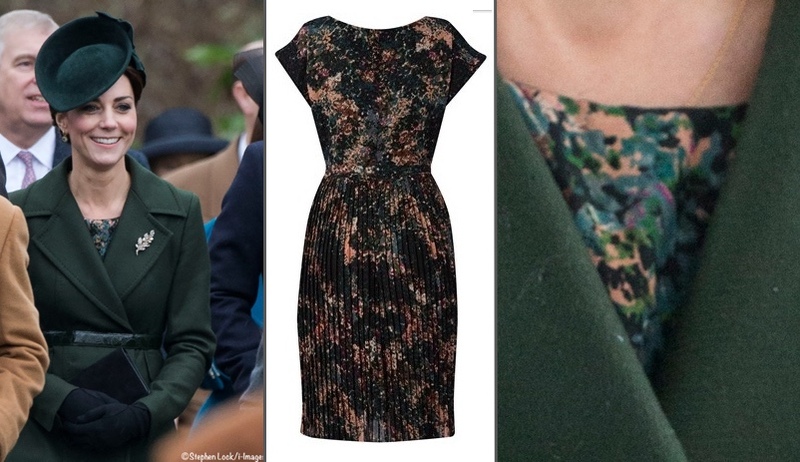 Then just this past Christmas we saw Kate wearing the Cezanne in another colorway, the green ‘pine needle’ dress. Now the retailer has reissued the frock in an entirely new colorway. Another look, this one offering a better view of the fabric. The new color is called ‘navy ebony combo’. Just like the original, the frock is 100% polyester (it’s even machine washable), with pleats from waist to hem, cap sleeves, and a back zipper. The dress is offered in sizes XS to XL, it is priced at £75, roughly $110. Well its better than the other night. Not a fan of that kind of high necked long sleeved blouse but it can be a good base for styling. Of course none was done here. The skirt isn’t well tailored – a necessity for bulky fabric. It hits her too low at the waist (compare to the model) and its too long. As always Kate is under-styled. A big navy/royal blue belt would have helped pull it together. Cut 3 inches off the skirt and it would be a much fresher, younger look. I consider this a miss. While the fabric on the skirt is magnificent, the style is something I would have worn as a young professional in the late 80’s in the US. That skirt is beautiful! If I weren’t so tiny I would grab that skirt up; it’s simply beautiful, especially with that top! I love Harry’s shoes too. The little pop of color is so youthful. I have totally fallen in love with both this skirt and blouse. Catherine looks stunning! I do love billowy sleeves, all those feminine 70s styles seem to be everywhere now. It’s also the sort of blouse I’d buy four of for the office etc. In fact, Kate does do private work & attend meetings for charities & this is the sort of blouse she would wear. The skirt was appropriate for visiting children but was an occasion when one of Kate’s chunky belts would have improved the overall look as she has such short legs, it would have broken the body up & balanced the overall look. (It reminded me of the 2 occasions she wore the beige lace dress, with a satin sash-belt the first time & without anything the 2nd time – it showed why she seemed to wear a belt with everything). I don’t like the skirt, it reminds me of patchwork skirts that ‘older’ people (anybody old enough to have a teenager) wore in the 70’s. I’ve always hated those front inverted pleats too, nondescript & staid. However, that’s just personal opinion. I agree about the trousers version though. Not so good, probably would suit those with spiky blue or green hair student types. I though the shoe colour & style went particularly well. I second the trousers. Lord, hear our prayer. I agree, Kate is looking well rested. Good for her if she’s had some treatments! I think I’d do the same in her position. Kate does look great today! 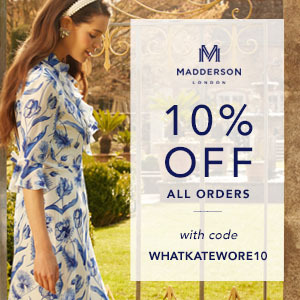 But I really want to know what Rebecca Deacon is wearing! That top is cool. I LOVE this outfit! She looks perfect for the event and I think that skirt is a nice surprise from the Duchess. Fabulous look. Crisp, modern, fresh. Love it. I think the DoC looks great. I would not have expected her to wear this skirt and I’m always pleased when she surprises me. Nice alternative to her usual solid color, small print or floral choices. The off white blouse is grating on me just a tiny bit where the white in the skirt is a true white but it really is not all that noticeable. I always imagine how I would tweak her outfits to amp up the style. If the DoC were more adventurous, I would have loved this skirt paired with red peep toe shoes and a very stylized and tailored button down the front white blouse. Something with oversized cuffs and collar to compete with the boldness of the skirt. Faith, I completely agree! I really do think she looks great in this ensemble – fresh, young, and professional – but just a tad staid, in my opinion. I can see in my mind’s eye the changes you describe, and think “YES!” Again, while I really do love her look, she could have truly made her clothes pop with a few minor tweaks in a more adventurous direction. Wouldn’t that look great? :-) I feel that she almost gets there but then holds back. Oh, well. She looks lovely no matter what though. I think that Kate looks great. 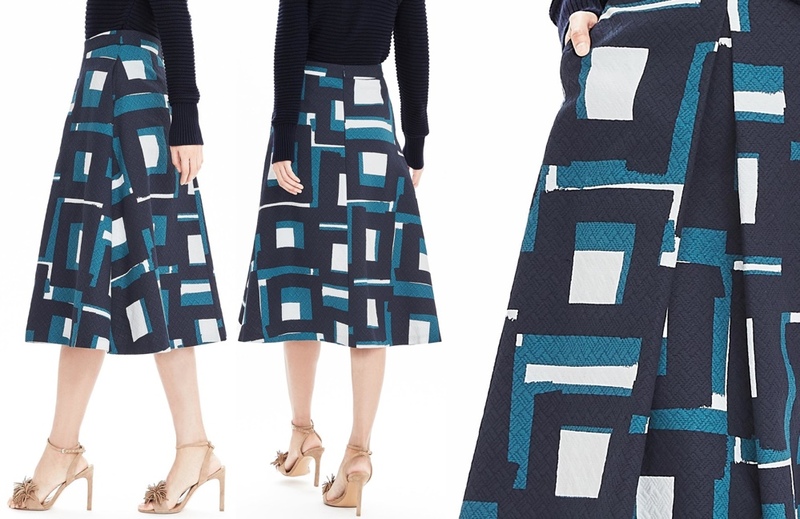 I could never wear such a bold printed skirt because I’m petite but on her it really works. I have not been a fan of Goat fashion but this blouse is nice. I really don’t like the print on the skirt. Lovely! I like everything about this outfit. I can see such versatility with this skirt and blouse. I imagine the skirt with a blazer and boots for fall/winter. The blouse would work with jeans/slacks and even a lace skirt for an evening event. I too noticed a little more eye liner than usual. I have the pants version of the skirt. The fabric is wonderful. It holds its shape but is very easy to move in. This skirt is hideous as well as being way too long for the duchess. A sleek pencil skirt right at the knee would have suited her much better. The blouse is nice though. If I am allowed to be a bit nitpicky, I wish the waist had gone higher. This skirt alone looks nicely shaped but it did accentuate Kate’s long torso from most of the angles. Maybe adding a wider belt could have helped? I thought she looked terribly long waisted too. I think ur should have been adjusted or had a belt to ‘raise’ the waist. Actually, I think wearing separates in and of itself helps with the long torso problem, and that’s one of the reasons I’ve been advocating them for the Duchess. A difference between the top and bottom visually divides her torso and avoids the problems often presented by monochromatic dresses. I thought this skirt and blouse combination was a success for that reason. However, as I noted, longer skirts do present proportion issues even for the best figures and legs. 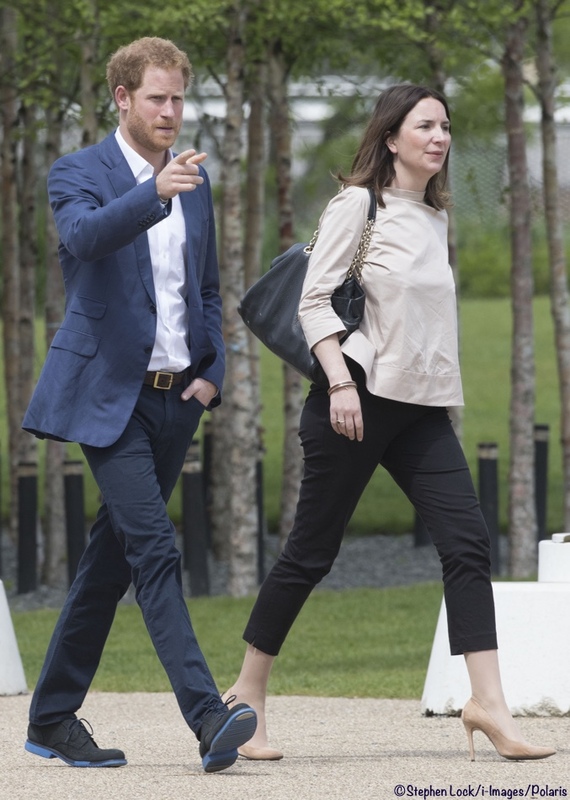 Because the Duchess has slim hips and great (albeit a bit short) legs, those issues were not as obvious in this outfit as they might be for other women. Love this skirt and blouse, just not together. As simple as this blouse is it still seemed fussy next to this fab. Bold print and textured fabric. Harry wins the fashion prize today 🙂 those blue soled shoes!!!! This is a winning combination in my eyes. 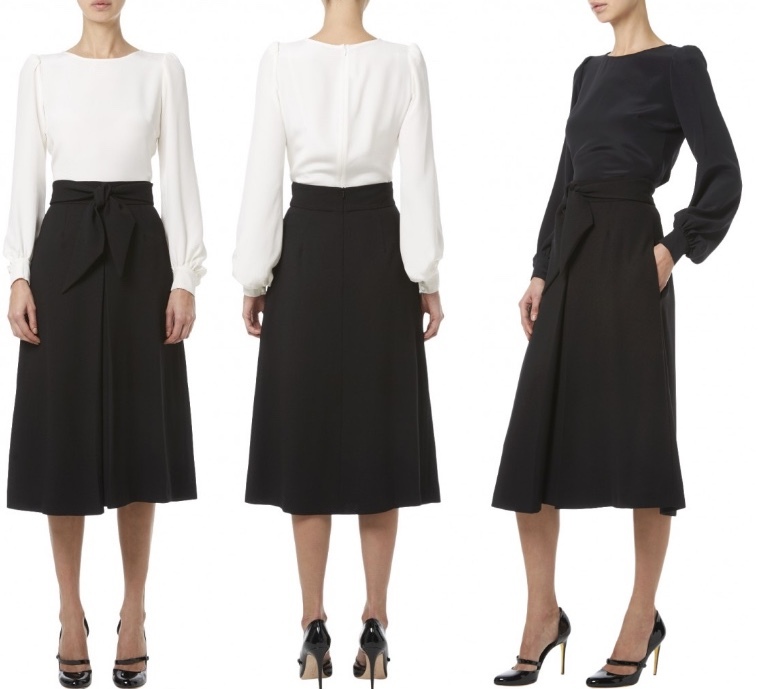 Elegant and appropriate – words I seem to use often when discussing Kate’s clothes. I love the blouse – a classic piece and the skirt is an interesting and striking piece that looks great. I love the femininity that Kate displays and yet this outfit is practical too. She can ‘box’ in it and hunch down to talk to children something that is not always possible in a tight straight skirt! It’s always a pleasure to see William, Kate and Harry together – they look as though they really enjoy each others company.. I like it. And certainly she does not look pregnant, so that doesn’t explain the red jacket fashion faux pas of the other night. This is a win. Modern, confident, effortless and a return to the Kate I’ve missed. At first glance, this skirt appeared quilted (I’m a sucker for quilted skirts, casual, formal or anywhere in between). The detail picture, however, reveals it comes by its texture via an embossed or faux matelasse effect. 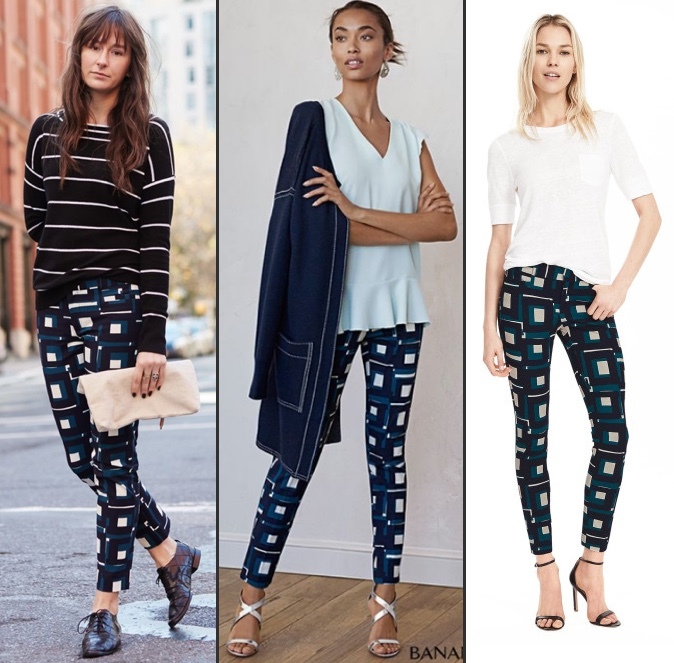 Banana Republic’s “geo jacquard” seems a bit of a misnomer. I think of jacquard achieving pattern via the weaving/construction of the fabric, where here, the color/design appears to be printed and the texture embossed. Regardless, the skirt and overall look is terrific. I could see her pairing this skirt with a fitted plain navy tee for an event where she’s interacting with children. Also like the trio’s coordinated look, harmonious without being matchy or uniformed. Well done. And a nod to Harry’s blue soled shoes! I think this is a fantastic look for Kate! And well coordinated with the boys! Thank you so much for the music. As soon as I read that line about her request to the DJ, I mulled to myself ” I wonder what that song, ah, ” And, there it WAS for me to hear. Many thanks for your always outstanding reporting and sourcing. Very nice skirt and good to see a completely different look. I won’t mention her hair because yesterday I was critical of the outfit so today if I can’t say anything nice…… I won’t say anything! The blouse does not suit her figure,esp.the sleeves portion.This is more noticeable in the close up shots..Other than that I like the skirt a lot. I love this. I think the blouse goes perfectly. Honestly I own a few pieces that look the same in general but different so don’t mind she owns a few white blouses. Skirt is a winner IMO. But my favorite had to be Harry’s shoes… Love them! I’m so pleased we haven’t seen the last of bold patterns on Kate – what a snappy, fresh outfit. I love the skirt’s geometric pattern and the length is perfect on her. Not so sure the pattern transfers happily to trousers – they look a touch clownish to me. I have a private aversion to skirts with a pleated front on a plain back as they can too easily seat themselves. It’s possible Kate’s slim hips act as antidote and a deep single pleat is one way she can get fullness without the flyaway hazard. The blouse is a superb classic piece, Goat have surpassed themselves on that one. It’s the kind of item I might want to wear until it fell to pieces. It’s so hard to find something as timeless and beautiful, free of designer kinks, but still contemporary. I very much like the black one too. Hahaha “they look a touch clownish to me”—-I was literally thinking that I like the skirt but the pants look like a clown costume! I agree with the rest of your comments as well—-especially in regard to the blouse. Sorry, another miss. The skirt is an awkward length for her…The whole ensemble looked oversized. I love the colors and choice of print, but I don’t think this ensemble is proportioned correctly for Kate. As she is very long-waisted, a skirt that has the effect of further shortening the leg (however slim and shapely) gives a bit of a top-heavy effect. Totally agreed — a low waisted midi skirt just makes her look stumpy. I really like this look, though I’m puzzled by Kate’s decision to buy very similar looking pieces (how many billowy cream blouses does she have now? At least 3.) The skirt is very fashionable, and matches the “heads together” blue branding. I was really really glad to see Kate gave a portion of the speech! Again, though, I’ll never understand why she doesn’t pin her bangs back when she knows she’ll be speaking. The head twisting to get the bangs out of her face (while not touching them) is very distracting and something I’d expect– after 5 years in this job– she’d know to avoid. I was so pleased to see this white blouse because her others have so much lace and decoration on them I find them fussy. I’d like to think this one was more versatile, and maybe a more mature choice. I agree with you on pinning back the hair! When I saw the live photos on Twitter, I was annoyed that she failed to remember how unprofessional the constant hair in her face looks, much less how annoying it must be for her! If she didn’t have bangs, I’m sure she’d just push it behind her ears. The easiest solution is to wear her hair back (loved the hair at the HM90 celebration the night before). This skirt is horrible!!!! The print and heavy fabric is very overpowering on Kate”s slim frame, another miss I am afraid. I love this entire outfit. The individual pieces are lovely, and they look great together, too. Nice recovery from last night’s disaster. Love the skirt and the blouse! Her hair are looking smashing! I noticed her makeup is a bit different today- heavier top liner with a teeny touch of a wing which I LOVE- and try to do myself all the time! It looks beautiful. I think Sally Branka’s work has really changed how Kate applies her own makeup. 🙂 It’s the first time Kate has worked with a true makeup artist since her engagement (I honestly don’t believe the Bobbi Brown instructors were much more than sales associates). I liked this look very much. Happy to see a switch-up to separates; a bold statement with the skirt; and I thought the blouse softened the look and made it a bit more Kate-like. And always enjoy those 3 together. I always wonder what it will be like when Prince Harry chooses to throw a 4th into the mix. ;). Forgive me if you’ve mentioned this before, but do we know what hose the Duchess prefers? I’d love to find some that look as good as what she wears. Also, I love the shoes on the Goat model! Lol! I buy ordinary tights from JLP and love ’em! She looks beautiful. Kudos to wearing separates. Love the skirt and it’s graphic print, texture. It could be shorter and worn with a chunky belt. Like that the colors blend with William and Harry. The blouse is ordinary. Meh. Appreciate the mission and meaning to the event. I love the skirt. LOVE. Youthful, modern, on-trend, and patterned. But paired with this matronly, puffed-sleeves, Anne of Green Gables blouse? (don’t get me wrong, I love AOGG) Yikes. Between this outfit and yesterday’s, I wish she gave more thought to her pairing of pieces. Just because items don’t clash doesn’t mean they go together. “Just because items don’t clash doesn’t mean they go together.” PREACH! I’m afraid that when she combines separates it’s more often miss than hit .Today’s outfit is another miss for me. The skirt is heavy, with a bold pattern and doesn’t go with the simple, billowy blouse. I love both pieces, just not together. Very nice look! I love the skirt, very appropriate for the season and the occasion. Love the skirt, but I’d never pair it with a cream blouse. It looks like I do sometimes when I get dressed in the semi-dark closet & can’t quite tell the true colors of clothing. Disappointing – I usually love her choices but this one is another miss. Oh I love the blouse with the skirt:) So interesting how everyone reacts to the same outfit. I thought everything looked very good together, professional but with some interest with the great skirt. I thought an excellent choice for the engagement. Kate always looks good in separates IMO, and this is no exception. With her tall and willowy figure, she can wear blouse and skirt combinations with ease. It’s business-like, and feminine, perfect for daytime. All three of them look terrific, and fully engaged in this important mental health work! Well, now, this is interesting. The midi length and bold graphic print of the skirt take us into more up-to-date fashion territory than the Duchess is normally wont to tread, and I think the overall look works very nicely. I really admire the skirt print from the point of view of making a good, strong statement. I’m always cautious where the cut and length of midi skirts are concerned. A-lines like that are not, in my view, flattering on everyone, and you always have to be careful about where the hem hits: on the calf, rather than right below the knee or just above the ankle, can cut the leg off at the most unflattering point, unless you’re blessed, like the Duchess, with spectacularly good “pins”. I’m also not crazy about the cut of that blouse; there’s nothing really wrong with it, it’s just a design I’ve never cared for. However, I think it works with the skirt. Banana Republic is a label with which I’ve had a long relationship for casual clothes, though recently, I’ve had trouble finding anything there I’d wear. I think BR quality has significantly deteriorated, too. In the 90s, they upgraded from their safari-look roots and were selling wonderful silks, cashmeres, and wools, but they’ve reverted to a more downscale look and quality over the past decade or so. I think they’re still worth checking out, as this skirt suggests, but I spend considerably less money at BR now than I once did. Oh, and I’d advise not ordering anything from BR online. Their sizing has become very unpredictable of late. It is sad that the quality of so many clothing lines has really deteriorated. I have been lamenting the decline in the quality of clothing for 20 years now. I am appalled at even the poor workmanship of designer items. Not the best of fabrics, no linings were linings are needed, patterns not matched etc. etc. A few labels still do a relatively good job but so many do not. I am not buying $5,000 dollar day dresses and maybe the quality is there in those lines but I do see poor fabric and workmanship in $2,000 pieces:) I have a St.John skirt purchased a few years ago which is well made so there are some lines out there still doing a good job. Nice change of pace. We don’t see Kate in separates often. This is a very nice casual look. Wow! She looks absolutely beautiful in this outfit. This outfit ensembles is far exceeded that of Goat. It’s great that Kate is branching out more and more with separates and bolder patterns. Susan, I can’t believe you got this done so early – and on a Monday, no less! Nothing better than to wake up to a WKW post on a cute outfit. Awesome! Love the skirt! And that blouse is quite pretty. Thumbs up!